Hello everyone, and welcome to the Century Awards! This year, as in years past, I’ll be posting a winner every hour up to approximately the time the “real” Academy announces the Best Picture for 2016, coinciding with the Century Award for Best Picture of 1916. This movie represents the best traditions of actuality filmmaking, adapted to a new era and one of the most important human events of its period. 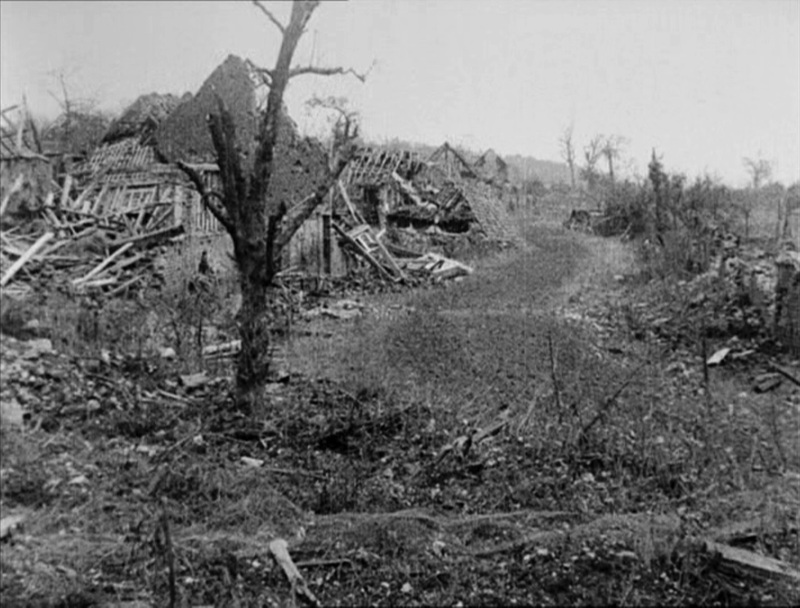 The Battle of the Somme was a devastating attack on French soil that claimed nearly a million lives and contributed to the attrition of the German army, although it was by no means a decisive Allied victory. British people, eager to see for themselves the struggle of their friends and relatives abroad, flocked to the movie, which also had a highly successful international release at a time when the British film industry was largely stagnant. While some scenes are obviously staged, and in general the photographers restricted to “safe” areas for filming, it is nonetheless a thrilling document of the First World War. 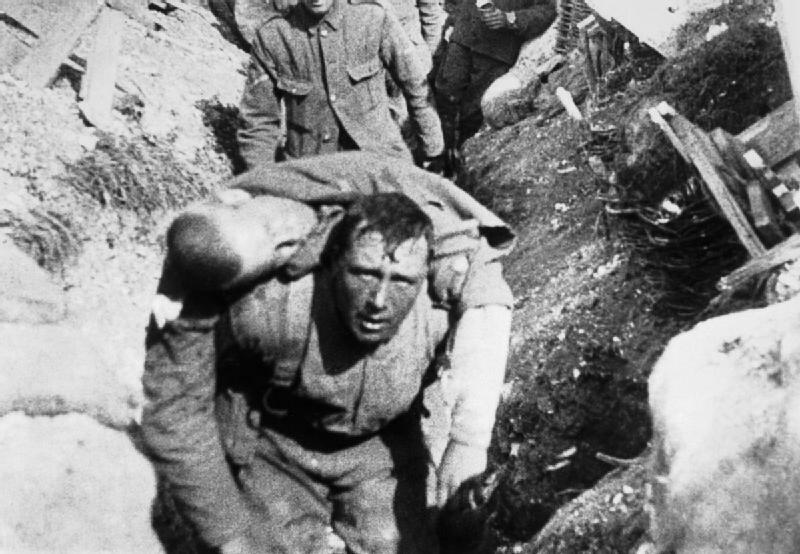 Comparable to the British documentary, “The Battle of the Somme,” this film shows the conditions of Canadian troops at the front during a critical battle in France. Taken together, these two films demonstrate a new sophistication in documentary technique, and in the appreciation their governments had for the importance of domestic propaganda in wartime. 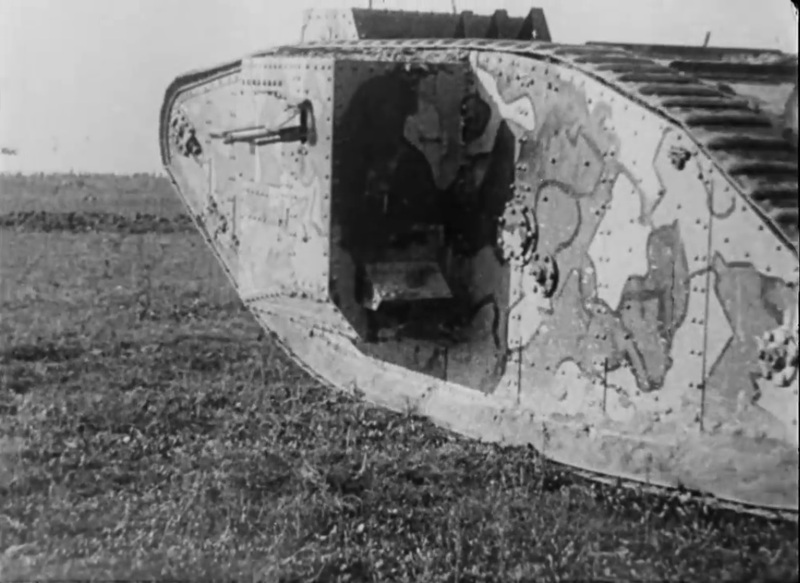 The film is subtitled “In Action with Our Canadian Troops,” although the information provided by Library & Archives Canada suggests that there is a second part, “Footage on Ypres, 1914-1917,” which I was unable to find separately – I think some of that footage has been edited in to this. The movie begins by showing us some troops on parade with the flag presented by Princess Patricia of Connaught, the daughter of the Governor General of Canada. We see various march-bys. Many of these troops appear sullen or uninterested in the camera, though there are a few smiles and glances. Soon, we get to the main feature of the narrative, which follows the Battle of Vimy Ridge, a three-day battle in northern France which involved four divisions of Canadian troops. 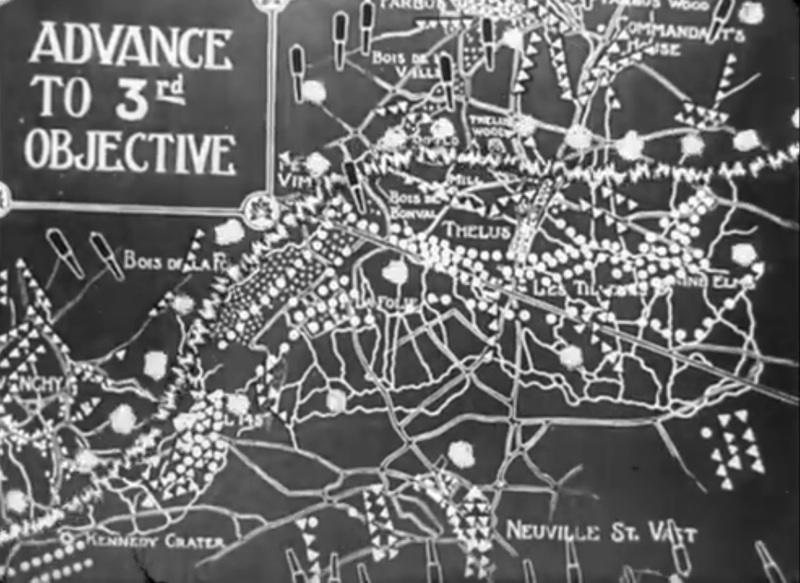 There is an animated map which shows the progress of the battle, connecting the footage on screen with events known from the newspapers in the audience’s mind. In fact, it is likely that some of the footage was staged or taken at some time other than April 9-12 (the duration of the battle). We don’t see any real combat, which would probably have been much too dangerous with the cameras of the time, although there are images of artillery firing and explosions far off across the battlefield. 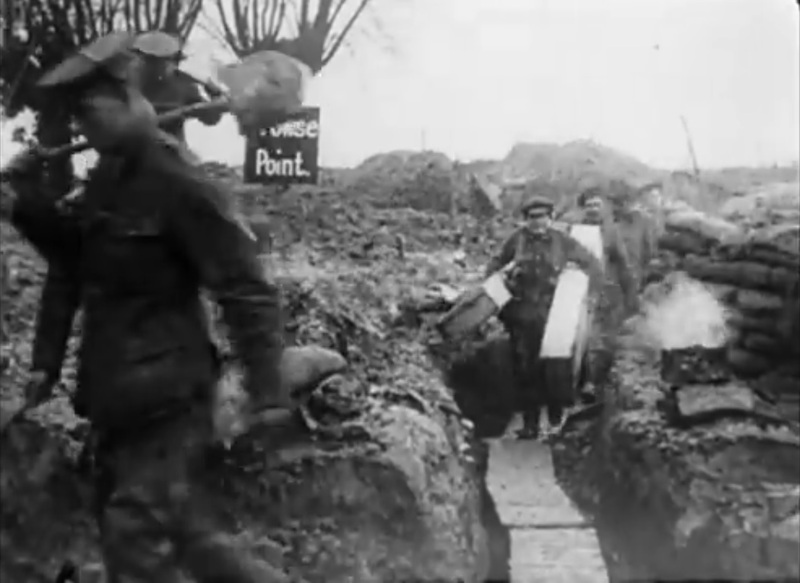 A lot of the footage is men walking through waterlogged trenches or marching and/or digging in the mud. The conditions look extremely uncomfortable and probably unhygienic. 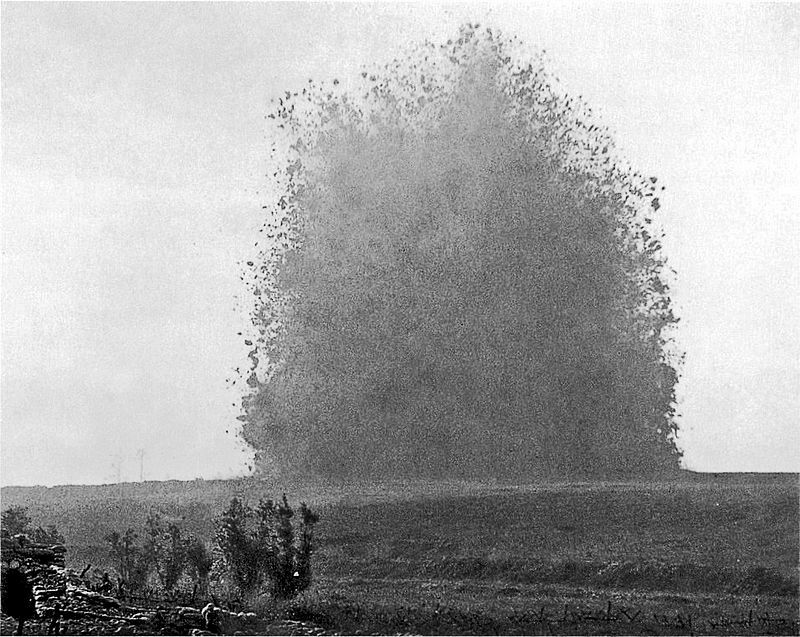 One pan across a group of men crouching in the cover of some trees shows them all duck suddenly; the Intertitles tell us that shrapnel exploded overhead at that moment. I suspect this was staged, but it does help to establish the sense of imminent danger on the frontlines. The film takes us through the successful advance of the Canadians and “digging in” their new defensive line. We see some of the “trophies” (captured artillery) taken, one of which has a lengthy sign explaining that it has been requested by the unit that took it as a trophy. The movie ends with an apparently unrelated image of a tank rolling through a field, probably on experimental maneuvers. 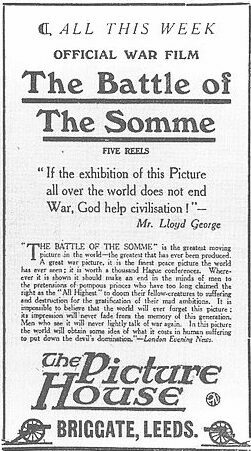 There are some interesting differences between this movie and “The Battle of the Somme.” I mentioned above that the troops seemed unexcited about being filmed – in “Battle of the Somme” the men frequently waved to the camera and all seemed very hopeful that they would be seen and recognized. One had the sense that the troops shown here were veterans, inured to the dullness of military service, and more interested in their next meal or rest period than in the camera. However, unlike the Battle of the Somme, the Battle of Vimy Ridge was a pretty clear Allied victory, in which the stated objectives were achieved successfully in a few days, rather than a months-long stalemate and meat grinder. We see less of headquarters and officers in general, focusing on foot soldiers and artillerymen at work. We also see no Germans, even as prisoners, and no dead bodies. While this is a somewhat bleak portrayal of the conditions of war, it avoids anything shocking, perhaps due to responses in England to “The Battle of the Somme” the previous year. I found the inclusion of the animated maps very useful in giving an interpretation of the mostly pretty ordinary military footage, and I liked how they cannon fire was shown to flash across the screen as the little triangles and dots representing the armed units advanced. There is a tendency to overlook the important contributions of Dominion forces in both the World Wars, reflected by the ease with which people will speak of “England” or “Britain” (or worse, “one tiny island”) as being at war with “Germany.” Soldiers came from nearly all points of the world to participate in the confict, and understandably wanted to be remembered and represented for their sacrifices. This movie at least preserves a part of that heritage for Canada, a country which was involved in the First World War from the outset, and their men had been at the front for almost three years by the time any soldiers from the USA arrived on the scene. This movie helps us a hundred years later to appreciate that the second-largest nation in the world made its own contribution to a struggle that may have centered in Europe, but was truly global in reach and implications. 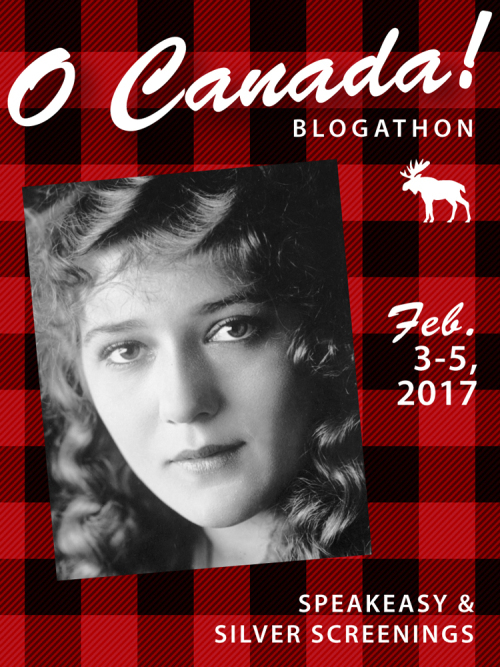 This has been my contribution to the “Oh Canada!” blogathon, being hosted by Speakeasy and Silver Screenings. If you liked this post, take the time to check out some of the other entries! You can watch it for free: here (no music). Thanks to Library & Archives Canada for making it available to everyone! This is an early behind-the-scenes film documentary, showing audiences how movies are made. It demonstrates to some degree the more elaborate equipment needed for sound versus silent film. It’s always interesting for a film buff to see how films are made, and even more so for a film historian to see the differences in how they were made in an earlier period to how they would be made later. The sound-recorder seems to have no microphone other than those trumpets, which are a good distance from the performers in this case, so you can see how hard it would be to get good sound, especially in a noisy location. Alice Guy was apparently an advocate of sound film from a very early date, and tried several different technologies to get it to work. What we see here is an example of the production of a sound-disc film, such as the “Trained Rooster” we saw earlier in the week. Ironically, the documentary of the filming has no sound, of course, so what we see is a silent depiction of the shooting of a sound film. Alison McMahan, in her book Alice Guy-Blaché: Lost Visionary of the Cinema uses this clip to argue that Guy was more decidedly a “director” as we understand it today than others of that time, although to me it looks like she is more interested in the sound than in managing the performance. In any event, the division of labor is clear at this stage, and perhaps especially so on a sound film. You can watch it for free: here (no sound on original). 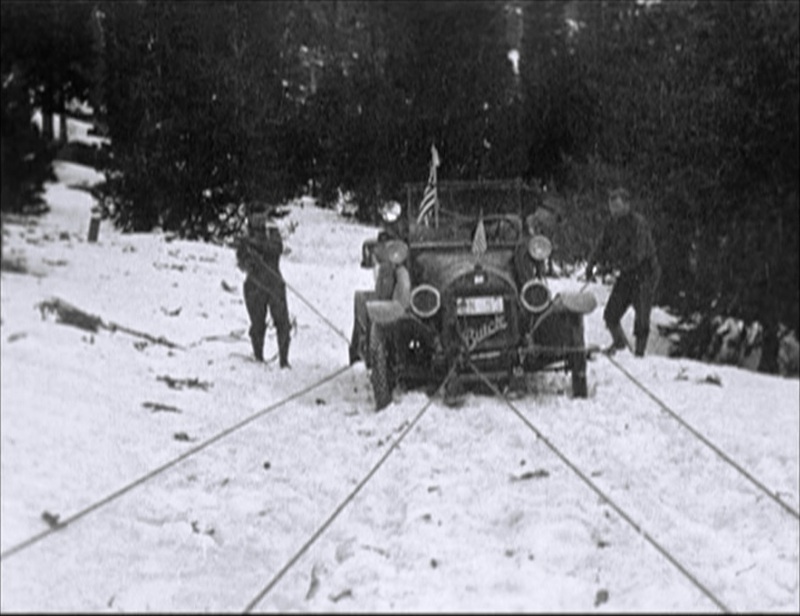 Sixty seven years before “Fitzcarraldo,” a small automobile club tried something similar – using ropes to haul a car over the Sierra Nevada mountains. Subtitled, “A Battle with the Elements,” this film documents their efforts, or at least purports to document them. 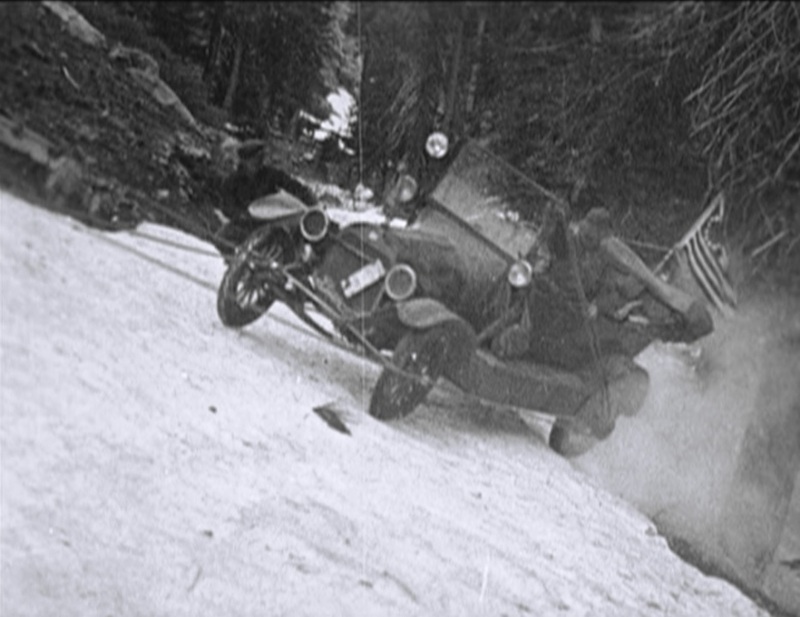 I say “purports to” because some of the shots are clearly staged, suggesting at least re-creations of the actual events, although it does seem to me that the film crew genuinely accompanied the car on its trans-montane journey. 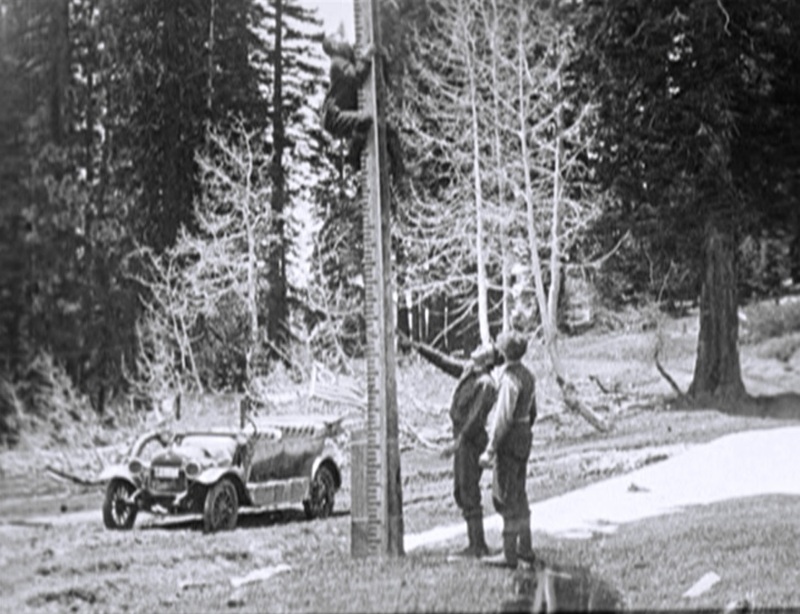 The film begins with the explanation that the Reno Commercial Club is offering a trophy for the first car to travel from San Francisco to Reno on the newly-opened road. We see a city street, a shiny new Buick, and three clean-cut strapping young men, departing on the journey. At first, the trip seems dusty and bumpy, but not too bad, and we get some nice travel footage of the mountains and quaint mining towns with wooden sidewalks. Then, things take a turn as we reach a level below the snow line where the road has largely turned into “bottomless” mud. Those young men don’t seem so clean anymore. Soon, every shot depicts two of them helping to push the car and take up slack on the ropes attached to trees and stumps that are being used to winch the vehicle along. What kind of road is this! It looks like a far more “extreme” sport than a simple drive in the country. The boys take time to scale a pole and plant some flags, and also set up camp near the summit to cook dinner, so there’s not much sense of urgency – maybe they’re the only ones in this race. 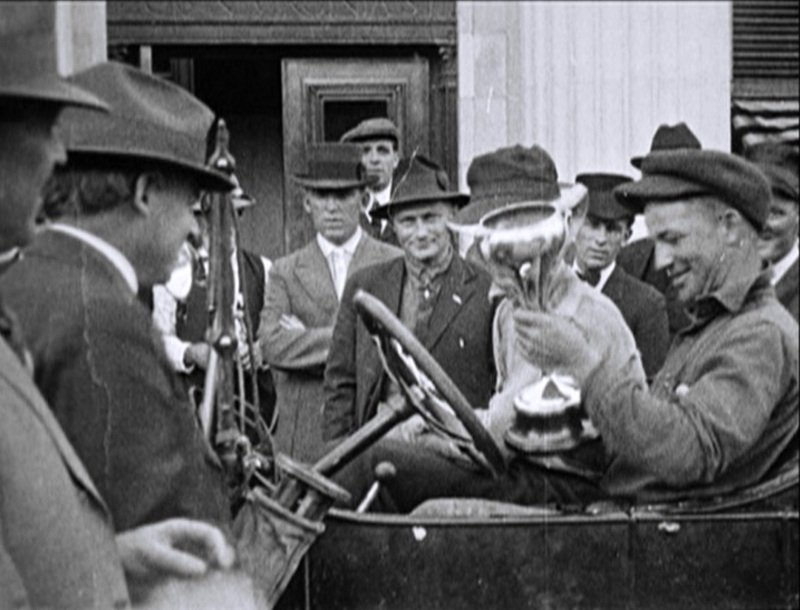 They do finally make it across, and down into the valley, where they can speed along at a decent clip, arriving in Reno and receiving their trophy. I thought the Commercial Club should buy them a new car, they really tore up the old one on the crossing! Plenty of time for leisure activities. As I’ve suggested, the “documentary” aspect of this movie is at least a bit staged. Nearly every shot begins with the cameraman in front of the car, so they must have frequently stopped to give him time to get into position and set up. Presumably, the rest of the time, he rode in the fourth seat in that car, but of course we never see that. There are some simple pans, but not a lot of camera movement, and few close-ups on the men are shown – the emphasis is always the car and its position vis-à-vis the elements. I wonder if the Commercial Club hoped that this movie would increase travel to Reno – the message seems to be that it’s a pretty inaccessible place, for adventurers only. I have not found this movie for free on the Internet. If you do, please inform us in the comments. There’s always a danger, when watching documentaries, of imagining that we are seeing unmediated reality, rather than a filmmaker’s attempt to simulate it. All the more true when the documentary comes from a remote period or is about an exotic subject, but this movie shows certain tell-tale signs of staging and of playing to an audience’s expectations. 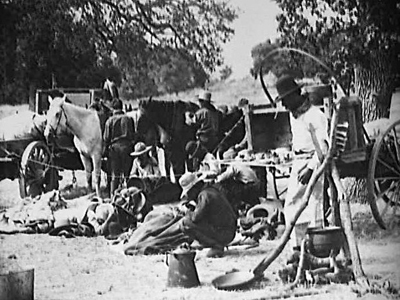 For example, did cowboys in 1912 actually wear gunbelts while going about their daily chores, or was that an expected convention? The film purports to show two days in the life of a Western cattle ranch, and there’s no denying that the horses and cows, as well as the skills with which they are handled, are real. Most of the movie takes place on the “open range,” and a dawn shot of a campfire and a coffee pot establish the ruggedness of our heroes early on. The production company was connected with the ranch, and I suspect that the cameraman had little other experience. There is a lack of imagination in the framing, and the focal length of the camera seems to be over-estimated, resulting in several blurry backgrounds where there should be majestic backdrops. Still, for horse-lovers and cowboy historians, there will be some material of interest here. I have not been able to locate this movie online. If you know where it can be seen, please comment below. This DVD collection is named for the 1964 documentary that heads it off, a nice early attempt at displaying the legacy of East Coast silent film production for a previous generation. The documentary is very American-centric, and gets several facts wrong, including calling “The Great Train Robbery” the “first narrative film” (!!!!). It also presents a few early movies with voice-over narration to explain the action, mostly as clips, but I believe the entirety of “The Lonely Villa” is embedded in the documentary. I wouldn’t choose to see it with the narrator, but it may work for some, and it’s reminiscent of the Japanese tradition of using a benshi to explain the movie to an audience. The narrator is eager to point out the proximity of shots and studios to the current location of the George Washington Bridge. In 1964, of course, the 19-teens were still living memory for some, and some stars they featured, like Gloria Swanson, were still living and acting. An essay included with the DVD covers much of the same ground, without the errors. Apart from this, there are three films presented as features in the DVD. They are “The New York Hat” and “The Wishing Ring,” which I’ve reviewed separately, and “A Girl’s Folly,” which is from 1917 so hasn’t become a Century Film Yet. Evidently, it and the documentary are “abridged,” and incomplete, so they shouldn’t be the main reason for getting this. The two movies I have reviewed are presented in very high-quality remastered prints with good music scores added that clearly are timed to the movies. The main reason for this collection, as far as I’m concerned is “The Wishing Ring,” which should have been played up more by the distributors, but the other materials on here are of some interest as well.